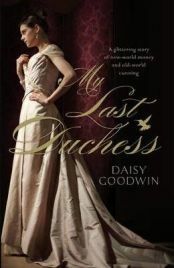 My Last Duchess by Daisy Goodwin is an historical novel, set in the 1890s in America and England, about a young American heiress, Cora Cash, her mother’s quest for an English title for her daughter and her marriage. Cora lives with every possible luxury in Newport, Rhode Island, and New York. She is said to be the richest girl in the world, but money can’t buy her freedom from her mother. She longs to be free, to be married, but her mother has plans – she wants Cora to marry into the impoverished English aristocracy, something her money should allow her to do. Cora falls in love, but soon finds that even money can’t make life a bed of roses. The story of My Last Duchess is far from original – the rich girl who only longs for her freedom can be found in numerous other places. The story is enjoyable, however, although fairly predictable – the hints as to the secrets behind Cora’s marriage are given early on, but are far too obvious. A hint should leave the reader wondering what is hidden behind the happy facade, not give the whole game away. I admit I wasn’t entirely sure which direction the story would take at the very end (and in the event there is some potential ambiguity), but that was the only point. I mentioned the ending above – Cora makes her choice, and seems to be decided on it, but a passing comment between other characters who could have been involved had the choice gone the other way indicates that perhaps all is not so black and white as it seems. The hint is there that things could change – but not from Cora’s point of view, whose choice it is. This is a strange ending, neither clear cut nor ambiguous. The ambiguity is itself ambiguous! I was looking for another chapter to tie things up, but it just stopped and I’m really not sure what the ending means for Cora’s future. Although enjoyable, the novel feels very lightweight. The best historical novels are completely absorbing, weaving multiple stories around numerous characters, but in My Last Duchess there is little more than the main story of Cora and her marriage. The details in addition feel like they merely skim the surface compared to other novels set in similar periods – although we are treated to descriptions of the almost unbelievable opulence that the Cash family live in, I found it hard to build a picture of them, their houses or their lives, something which I feel is important to an historical novel to allow readers to become immersed in the past. The characters do not on the whole elicit any strong feelings. I didn’t like or dislike Cora – she was very arrogant about her money and how she believed she could use it to makes others lives better, but on the other hand I felt some sympathy for her at times. At no point though did I find myself either loathing or loving her. Her servant, Bertha, was generally more likeable than Cora herself, but again I wasn’t terribly bothered by her. Additionally, the villains of the piece were quite obvious from the moment they were introduced, and although they were unpleasant characters I didn’t feel strongly towards them as you should towards the best villains. Goodwin writes well, and although she takes a few historical liberties with the timing of actual events, she explains these in her author’s note. Her style is enjoyable but again doesn’t elicit any strong feelings either way – while I can’t really fault it, I also can’t rave about it. Lightweight really is the best word to describe My Last Duchess. But that doesn’t necessarily have to be a negative point – it is a perfectly enjoyable read, can be read quickly and without a great deal of concentration. These are all good qualities in a book when you simply want to relax and read on a lazy Sunday afternoon or on holiday. My Last Duchess is a straightforward novel, one which does not arouse strong feelings, and is therefore a pleasant read. Thanks to Headline for providing a free review copy of the book. One Comment on "My Last Duchess"
EDUCATION, CHILDREN’S AND CULTURAL SERVICES. « Oh, Oh, Oh, It’s Magic!